The Proweight Twin Head Batch Weigher offers a faster method of weigh-packing a wide variety of dry, free-flowing products making it ideal for manufacturers and wholesalers looking to expand or upgrade their product distribution. Product is fed from the bulk hopper into vertical discharge chutes and product release is achieved with the use of a footswitch. The design of the Twin Head allows for larger pack sizes, faster throughput, leaves the operator with both hands free and enables the machine to be linked to ancilliary packing equipment such as conveyors and bag sealing equipment. Standard machines are constructed in powder-coated mild steel with stainless steel options for the food industry. 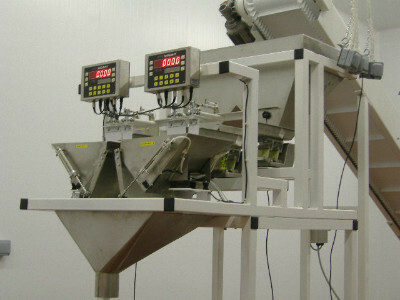 See a video clip of a Proweight Twin Head Batch Weigher on test here. 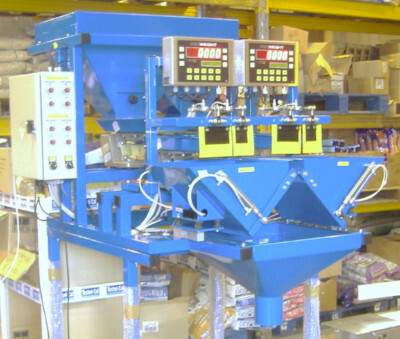 Fitted with two weigh heads and sharing a common bulk hopper and discharge chute, the Proweight Twin Head Batch Weigher is capable of handling products in pack sizes from 100g to 10kg (depending on product characteristics). With a throughput of around 20 - 25 1kg packs per minute, this machine can maintain accuracy of +/- 0.1% on every pack, all day, every day. 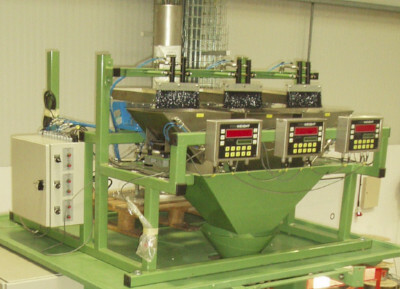 Proweight batch weighing equipment can also be linked to form fill and seal machines as shown in the photograph above, in this example in triple head format.